A certified nursing assistant in South Carolina earned mean annual and hourly wage of around $22,240 and $10.69, according to the Bureau of Labor Statistics in May 2013. The number of CNAs employed in the state was 18,400 with employment per 1,000 jobs 10.08. 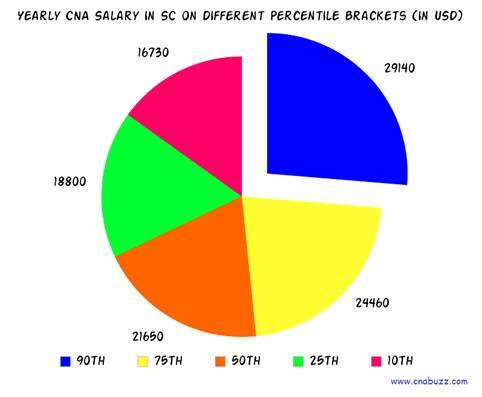 As per the statistics provided by indeed.com, average CNA salary in SC, in January 2015, was $24,000. When compared to the average salary on a national scale, these numbers were found to be 1 percent less. The major factors, that make a huge difference in the salaries of CNAs include the duration of work experience, employer, the location of work, and level of qualification. 90% of CNAs were salaried less than $29,140; 10% earned more than $29,140. 75% of certified nurse assistants were offered less than $24,460; the remaining 25% were offered more than $24,460. 50% of the employees earned less than $21,650; rest 50% made more than $21,650. 25% of CNAs were paid annual wages less than $18,800; 75% were paid more than $18,800. 10% of employees were remunerated less than $16,730; 90% were salaried more than $16,730. The working location of CNAs greatly influences their salary. In this state, Myrtle Beach paid the lowest median annual salary of $26,309 while the nurse aides employed in Greenville earned the highest annual pay of $29,742 as per the figures provided by salary .com. CNAs having advanced level of certifications and experience, earn more salary. In January 2015, CNA Hospice made $31,000 (the highest paid job title). The income of CNA Rrmc and Medical Assistant Family Practice was $29,000. The salary of CNA Float Pool Riverbend and CNA Neurology Riverbend was reported to be $26,000. The job opportunities for certified nursing assistants are faster than average, with a predicted growth rate of over 21% by 2022. This will generate 500,000 job vacancies for nursing aspirants. With the continuous growth of the medical field, CNAs are given the foremost priority for providing quality patient care. Choosing this career is a good idea especially for those, who are keen to work in the nursing field, but are unsure of which path to choose. Question 1 – Presently, I am working as a certified nursing assistant in the state of Colorado, but planning to move to South Carolina and start my career there. How much hourly salary can I expect in SC? Answer – The hourly salary majorly depends on the geographical location. It ranges from $13 to $15, where maximum number of cities offered $14 hourly pay to the CNAs. Question 2 – Does anyone know the top and the least paid job titles in SC? Answer – In SC, the top paid job titles are CNA Hospice, CNA Rrmc, and Medical Assistant Family Practice, who made $31,000, $29,000 and $29,000 respectively. The salary of Correctional Prison Facility CNA was reported to be $15,000.